Home / games / gaming / hard drive / hdd / kingmax / m.2 / pc / ssd / KINGMAX Introduces M.2 2280 PCIe NVMe Gen3x4 SSD. KINGMAX Introduces M.2 2280 PCIe NVMe Gen3x4 SSD. 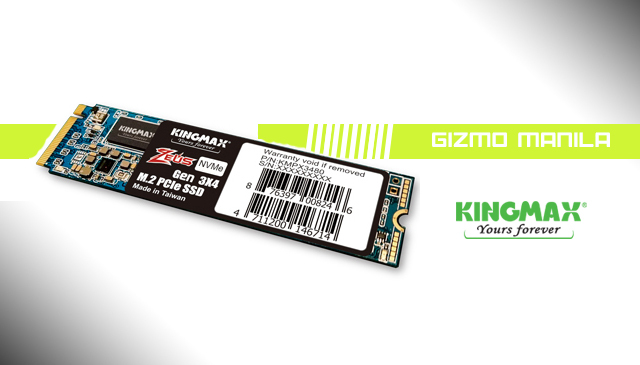 KINGMAX Technology Inc.,announce the launch of Zeus M.2 2280 PCIe NVMe Gen3x4 SSD PX3480. Along with the growing demands for smaller yet faster storage, M.2 PCIe NVMe SSDs are getting more and more popular for its incredible performance and its compact size. In order to fulfill different storage needs with more product offerings, KINGMAX releases M.2 2280 PCIe NVMe Gen3x4 SSD PX3480 which is compatible with most M.2 NVMe 1.3 standard supported devices including ultrabooks and gaming laptops. Optimized with the PCIe NVMe specifications and 3D NAND technology, the M.2 SSD PX3480 delivers breakthrough sequential R/W speeds and wide-ranging capacity choices of up to 1TB, which is especially ideal for gaming enthusiasts and multitasking users who are trying to get in the game faster or store more of their important media contents. The KINGMAX M.2 2280 PCIe NVMe Gen3x4 SSD PX3480 features incredibly high sequential read/write speeds of up to 3,400/3,000 MB/s, where its read seed is 6 times faster than SATA III SSDs. Furthermore, it applies the intelligent SLC Caching and DRAM Cache buffer technology to further accelerate transferring speeds and system response time. No more long waits for application loading and data transferring, the M.2 PCIe SSD PX3480 is perfect for gaming, media editing and multitasking. In addition to its stunning R/W performance, the Zeus PCIe NVMe SSD is designed with a tiny M.2 2280 form factor that lets you store up to 1TB of your important files without occupying much space of your thinnest notebooks, mobile applications, and PC desktops alike. Its also 100% factory-tested to promise high stability, durability, and compatibility. It is backed by a 3-year warranty for complete after-sale services.